So happy to have something my dog can carry all of her things on her own. Very nice bags. Well built and sturdy, would hold up for trail use. Small holds surprising amount of items. Already have the harness for the bags. Small dog. Can not recommend these bags for any dog smaller than the weight recommended, or even slightly larger (<21#'s). Have a 12# (pom mix w/???) she looked ridiculous with the packs on her harness. Packs are sturdy enough that for her weight I really could not put much in them before they were too heavy. Returned them only because I have too small of a dog to use them. What I really need is "bags" about the size of the outer "envelope"/"easy access outer pocket" part of the bag, so she can carry her collapsible bowl for water, some poop bags, and maybe some treats/snacks; also could be about 1" shorter. Based on her personality I've been told she needs a "job", carrying her basic hike items would be a good start. Harness gives me a way to hold her without picking her up or holding on to her collar at her nap, as well as providing a way to assist her over higher obstetrical and into truck without fully picking her up. 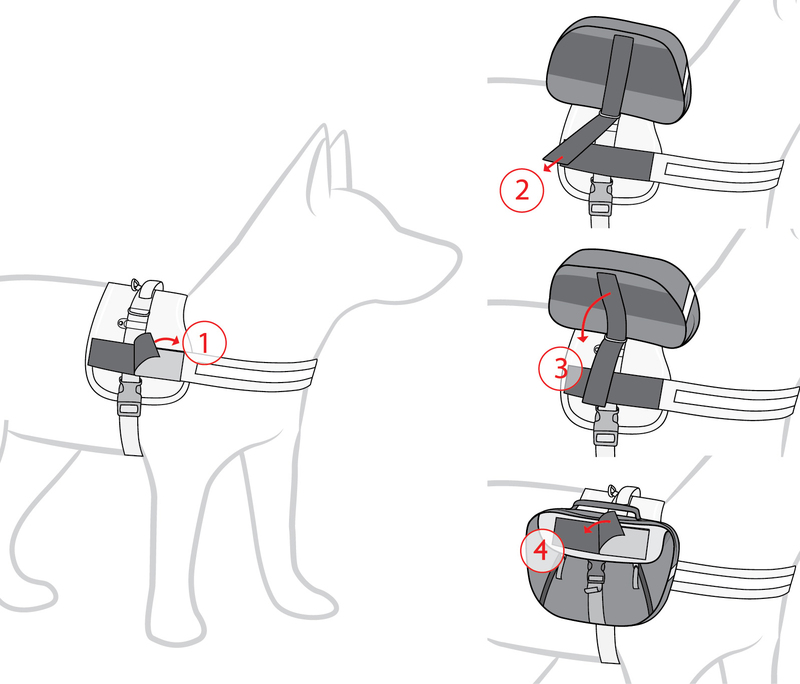 I have a service dog and these saddle bags are a great addition to the convert harness. These bags allow my pup to carry emergency asthma and epi pens for me. These bags fin on the harness with a large strap and Velcro making it very sturdy. Doesn't move around, and stays in place. Bags are very well made out of strong materials and I expect it to last a long time. These bags work great for hiking trails and hills with my dog. He can now carry my keys, phone, water, and other stuff. 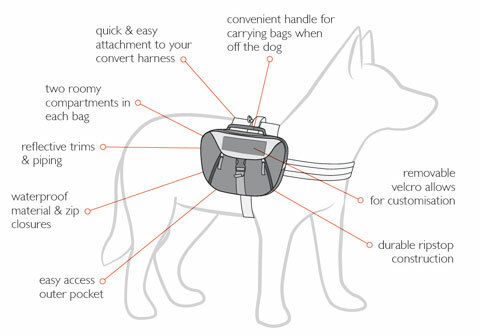 The bags need to have close to the same weight in them or the harness will lean and twist to one side or the other making it difficult for my dog to walk. I simply move items from one bag to another until almost even. When ballast is nearly equal he can even run with the bags on. I found myself wishing I had bought the backpack and saved money. These bags and the harness together is over 100 and the backpack alone is less than 70. I thought the removability of the bags was over priced. Bags are good quality as are all of their products. EzyDog says: Thank you for your comments. The weight in the bags should be fairly evenly distributed for the comfort of your dog. If you encounter movement of the bags, we recommend snugging up the harness. I work with a service dog on a daily basis and he is wearing his harness under my desk as I type. I purchased the harness because I wanted these saddlebags to hopefully solve the ongoing travel dilemma of too much stuff. The saddlebags are *almost* perfect for my needs and the only way I can think to make them better would be to make the bags secure to the harness with a clip and then secure them using the hook&loop (velcro). it just takes too much time to thread the hook/loop strap through the little plastic rectangle and then secure it to be the perfect solution to traveling and going through security. That doesn't mean these aren't a wonderful product, because they are. One of the reviews I read stated that the large bags were too large for the large harness and thankfully I didn't find that to be the case for us. My SD can still move well with the bags packed although he does occasionally whack into a corner or two until he realizes he has extra girth. The bags themselves are well designed and there are two sections for which to store your (or their) stuff. The front has pockets which I used for documents and my kindle (in case) and the large pocket held ziplock of food, collapsible bowl, and water bottle (empty). The customer service at EZYDOG was wonderful. The Convert Saddle Bags Are Great!! I love these saddle bags. 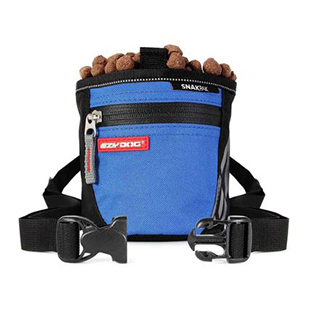 The zippered compartments are roomy and attach nicely to the Convert Harness by velcro and strap. The reflective piping is an excellent addition to making my dogs visible at night. Very well made. Thank you EZDog! My service dog has always worn an Ezydog Convert harness. Having a service dog with me 24/7 means I always have a ton of stuff I have to carry around and I decided to let my dog share some of the load, so I ordered a pair of saddle bags. Originally I ordered the large which were much too big for my needs. The small bags are just right and don't look obscenely huge on his 50lb frame as the large bags did. 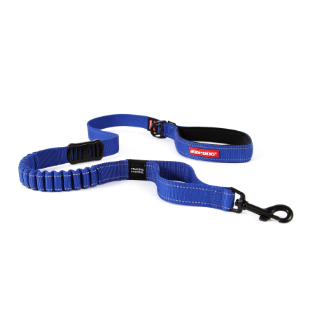 They are extremely well made (just like the harness) and will clearly last a long time. The integration with the harness is excellent.